Recently, Falvey Memorial Library obtained access to the International Encyclopedia of Ethics, an essential reference work in the field of ethics and philosophy. The encyclopedia is a comprehensive resource comprised of over 700 entries, ranging from 1,000 to 10,000 words in length, written by an international cast of subject experts. It provides clear definitions and explanations of all areas of ethics including the topics, movements, arguments, and key figures in normative ethics, metaethics, and practical ethics. Hosted on Elsevier’s Science Direct platform, the IEE interface is simple enough for new researchers while providing the flexibility required by advanced scholars. 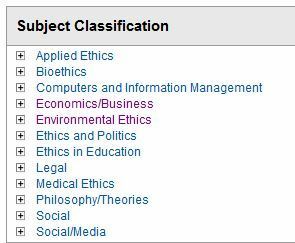 From the IEE main page, users can browse broad subject categories ranging from traditional subjects such as the Ethics of politics to modern issue such as computer and information management ethics. The main search box allows for broad searching in all subject classifications and the results page displays comprehensive search limiters that allow users to limit results to particular resource types (books, articles, etc. ), dates, and other useful parameters as well as the ability to check off and email multiple articles to themselves. For more information or assistance, contact Rob LeBlanc, First Year Experience & Humanities Librarian.